Some Mefloquine Warriors took to the streets of Calgary to protest the further use of this dangerous, debilitating drug. Many thanks to Dave Bona for sharing. Well done to Dave and the team in Calgary. 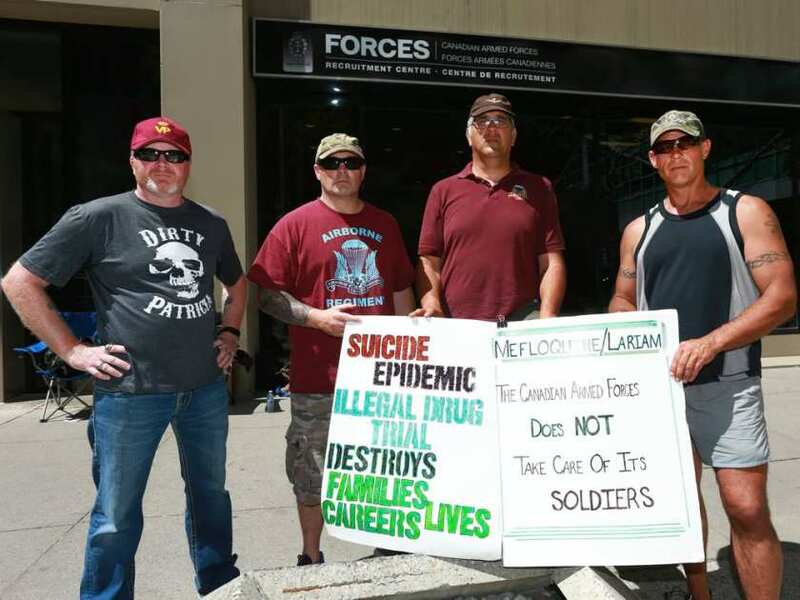 Canadian veterans are stepping up their opposition to the military’s continued use of the anti-malarial drug mefloquine, widely blamed for neurological disorders. (L-R) Veterans Todd Gilman, Dana Johnson, Dave Bona and Christian McEachern protest in front of the Canadian Forces Recruiting office in downtown Calgary on Thursday July 13, 2017. The group were voicing their opinion on the military’s use of a malaria drug.